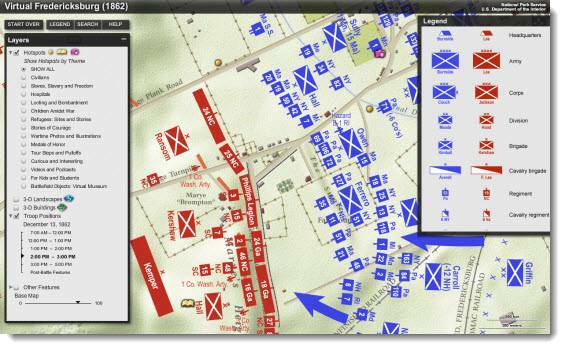 Blue Raster is working with the National Park Service and International Mapping to create an interactive modeling application for the Battle of Fredericksburg (1862) and the Battle of the Wilderness (1864). Created using ArcGIS Server 9.3.1 and Flex API, the mapping tool will allow users to identify hotspots in the area as well as locations of damaged buildings, looting, bombardment, slaves, refugee sites, hospitals, and troop positions. Users can link to interesting information from this map and can even change to a 3D view of the battlefield and of local objects and buildings. A slide control will allow users to follow the troop movement in timed sequence throughout the encounter, and then they can click on each individual troop formation for information. This interactive tool will serve as a virtual-park representation of this important Civil War battle for an area mostly developed with modern infrastructure. For more information on the National Parks Service please visit http://www.nps.gov/frsp/index.htm.